Rabindranath Tagore was a Bengali poet, philosopher, visual artist, playwright, composer, and novelist whose work reshaped Bengali literature and music in the late 19th and early 20th centuries. He became Asia’s first Nobel laureate when he won the 1913 Nobel Prize in Literature. 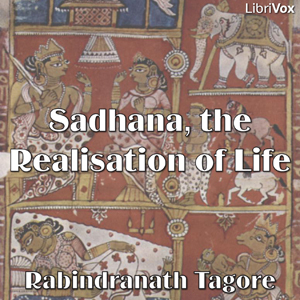 Sadhana is a collection of essays, most of which he gave before the Harvard University, describing Indian beliefs, philosophy and culture from different viewpoints, often making comparison with Western thought and culture.